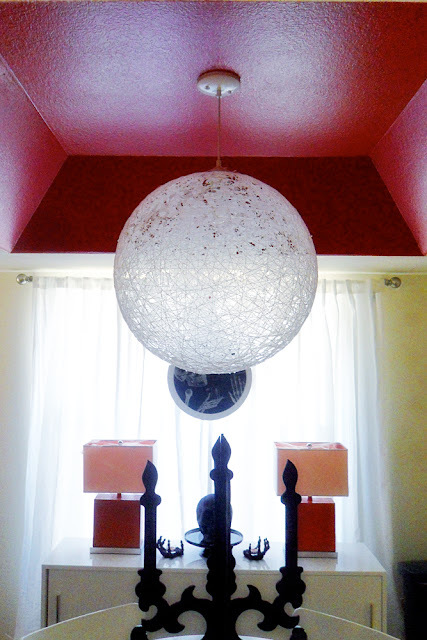 For this DIY project, I was inspired by the Random Light from DWR. 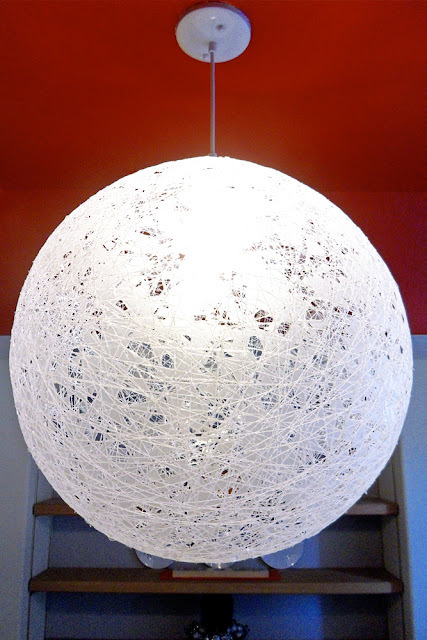 Unfortunately, I don't have $1,100+ to spend on a pendant lamp but DWR's images made the light look fairly easy to make so I did a quick Google search for some instructions and stumbled upon this tutorial from Instructables. One kids bouncy ball (about 18" in diameter) - $3. I wanted a bouncy ball instead of a regular balloon because I knew it wouldn't lose its shape while drying like a balloon could. I had to switch to plan B (an exercise ball) though so this didn't end up being used. 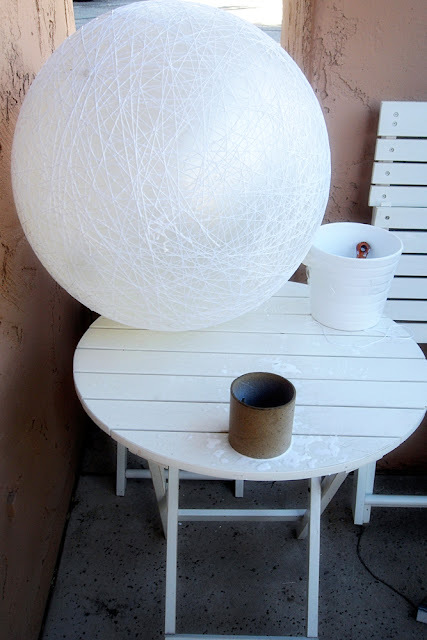 Unfortunately, when I brought the blue ball home, I held it up next to the pendant lamp I already had (the KNAPPA from IKEA) and realized it was about the same size. 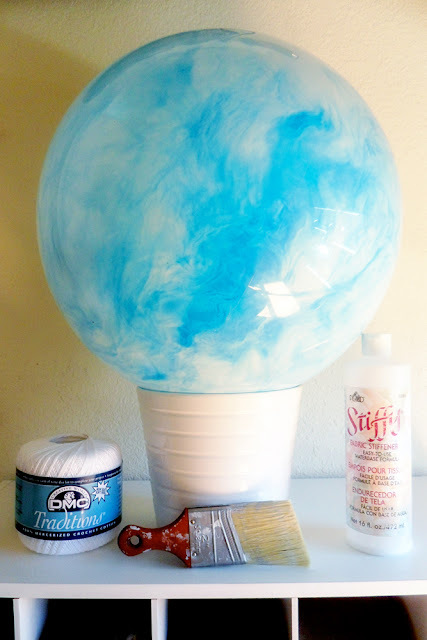 This would've been fine except that I've been wanting a larger pendant lamp for a while so I started thinking of a plan B.
I ended up using an exercise ball I had lying around that I got for $5 from Walmart about two years ago. It was the perfect size (25" in diameter) and I knew it wouldn't deflate and lose its shape like a normal balloon would. I started the process by placing the yarn in the white bowl and pouring the entire 16 oz bottle of fabric stiffener on top of it so it could soak through and guarantee that each piece of yarn would be saturated. 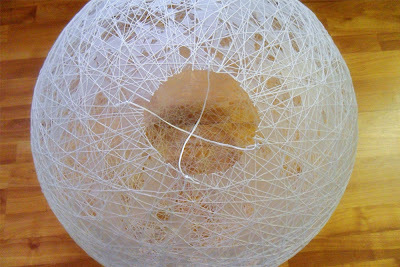 Then I started wrapping the ball with the yarn in random patterns until there was no more yarn left (about an hour). I wasn't able to take any in progress shots because this project was extremely MESSY (note the fabric stiffener mess all over the table) and my hands and arms were covered in fabric stiffener (wear gloves if you can). 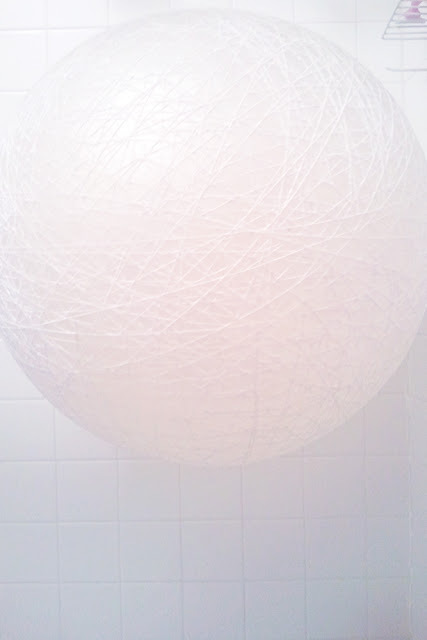 Once the ball had air-dried a little outside, I brought it in and hung it from my shower head to dry overnight. In case you're wondering why I hung it in my shower, I was paranoid that fabric stiffener was going to drip down and ruin my hardwood floors. After 24 hours of drying time, I took the ball down and began the removal process. Because an exercise ball is thicker than a normal balloon, I had to puncture it with a small nail several times for it to start deflating. Realizing this method was going to take forever, I used scissors to cut a hole into the side of the ball to speed up the deflating process. Once the ball deflated, I cut a hole out of the string so I could slowly pull parts of the exercise ball through it and cut pieces of it off since I knew the whole thing wasn't going to come out at once. To do this, I tied some leftover yarn from one side of the circle to another and repeated the process to form an X. If you look closely at the photo above, you can see the glue shell I was talking about earlier. It's hard to explain how I got the lamp to actually hang from the light fixture but I basically pinched two pieces of the yarn together and tied an additional piece of yarn around them to hold it in place. 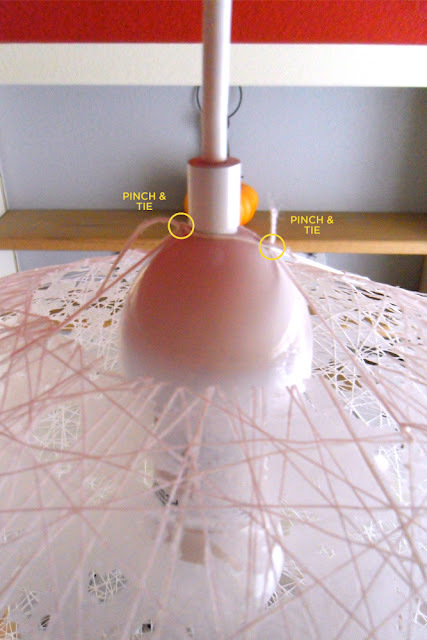 I repeated the process once more so the lamp would hang as level as possible. Oooohh I love it! Great job! Now that is a big project that had a big (and wonderful) outcome. Congrats on success! 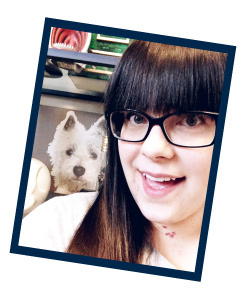 I just stumbled across your blog for the first time and like what I see! I am and artist that actually studied interior design, so love to see what people are doing in both industries. I have a blog as well, so I hope we get to see more of each other in the future! that is amazing, i can't believe you MADE that! someone needs to feature you, i hope you are linking it up places. i haven't looked at any link parties this week, so maybe you are. your doomicile (yay for wordplay!) is awesome. love those blood dripped candles and your whole color scheme! so glad you stopped by so that i can check out your blog! oh my i love it. is there a way to make a red one? maybe dye the string? white wouldnt work anywhere in my house. and is it fire safe? You can purchase colored yarn so you don't have to deal with dying it since that can be a pain. I got mine at Michael's and they had every color of the rainbow including gold and silver and Joann's would probably have the same stuff. As far as it being fire safe, I'm pretty sure it is. The lightbulb isn't close to touching the pendant lamp and I leave the light on for hours at a time and so far I haven't smelled any burning so I think that's a good sign! Wow!! Unbelievable! I have been wanting to make one of these for a while, but have been intimidated for some reason! Yours looks amazing! This is Awesome! I might copy this idea, if I can figure out how to make cylinder shaped ones. Hmmm. Hmmm, if you figure it out, let me know! 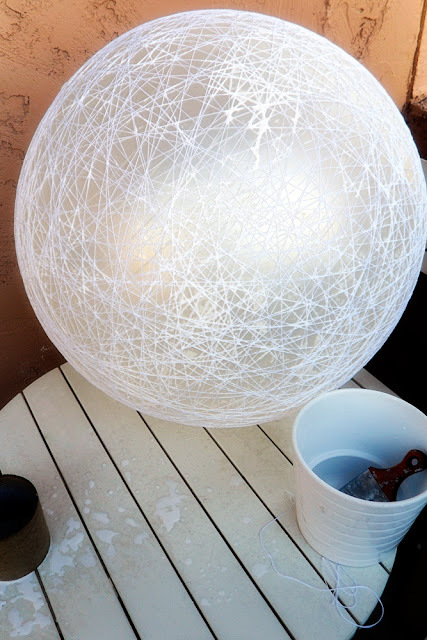 They'd make great hanging lamps over a bar in a kitchen or over nightstands in a bedroom! Oh my, this is simply amazing! I just love it - what a super creative and fabulous project. Fabulous piece of work but why don't you like the glue shell? It looks like an extra dimension on the photos. Does it look bad or have you set your heart on only the string showing? To be honest I like the glue film. It must look nice when lit at night. Also, this just makes your light more unique. I was wondering if the process of removing the glue film would be faster with a large bristle brush. That way you can pounce/hit a larger area at a time. I have that lamp on my Pinterest as well :) it looks really great! Hey I wouldn't be too gung-ho on getting rid of that glue shell. It disguises the light bulb a bit and I bet the ambient lighting at nigh is better with it than without it. It looks cool--chill! What yarn did you get from Michael's? It's the most delicate one and thus most sophisticated one I've seen so far.